Deb Sivigny's Hello, My Name Is..., the newest production by The Welders, begins every evening by literally welcoming folks into an unfamiliar home, as Aunt Rosey (Julie Garner) throws open the door of Rhizome DC and ushers in the assembled audience. The experience of an immersive theatrical piece is a perfect vehicle for destabilizing an audience, both literally and figuratively. We are thrust into a midwestern, relentlessly beige living room and plied with hotdish, with no clear picture before we step inside of where we're meant to be, much less who we are in this space and where we'll have to go next. The ensemble of actors are there to guide us, of course, and do so ably, but for me, immersive theatre is always served with a dash of anxiety and unsettledness. For a piece meant to explore the experiences of Korean adoptees in America, it's a potent combination--if I don't know what to expect when I've signed up for an evening of theatre, how much more unsettled would I be stepping into a new American home as a six year old child from Seoul. 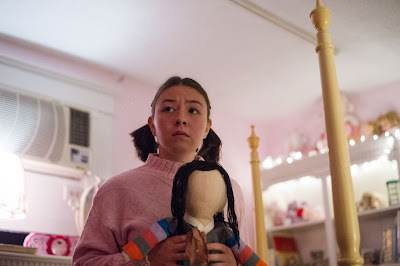 Linda Bard as June, a young adoptee, in her new home. Photo credit C. Stanley Photography. Sivigny's play looks at three different young people's stories, following their lives through the years and around the Rhizome space: June (Linda Bard), Dana (Janine Baumgardner), and Bryan (Jon Jon Johnson). All three were brought to America and placed with new families, but each has been shaped differently by that experience as the lines of home and family blur and are redrawn with time. Sivigny's experience as a designer imbues her play with an easy trust in the work of her own design team to transform the same few rooms across many years and miles, and that trust is rewarded time and again. Patti Kalil (Set Dresser/Props Design), Frank Labovitz (Costume Design), Roc Lee (Sound Design), and Katie McCreary (Lighting Design) do excellent work anchoring us in an ever-shifting experience, and Yasmin Tuazon's work on Choreography/Movement supports Randy Baker's direction of the ensemble. The strength of Hello, My Name Is... lies in its ability to embrace multiple perspectives of a complex topic, to give the audience characters circling around similar questions of identity and home but not finding the same answer--or perhaps not any one answer at all. Instead, the audience is asked to grapple with these same questions and emotional experiences as we observe and take part in these characters' lives. Sivigny based some elements of the play on her own life as an adoptee, but reminds us that these interwoven stories are only some of the voices in a larger conversation. Space is limited to only fifteen audience members per performance, and I highly recommend that you make sure one spot is yours before the run ends.